According to the Federal Highway Administration (FHWA), around 2.5 million accidents every year occur in intersections, comprising about 40 percent of all auto collisions a year. Half of all intersection accidents are classified as serious, and 20 percent of these intersection crashes end in fatalities. As you can imagine, these kinds of intersection and crosswalk car accidents are especially serious when pedestrians are involved. Salt Lake City, UT injury accident attorney Lynn C. Harris would like to consider some common reasons why crosswalk accidents occur. The above numbers look at intersection and crosswalk accidents from a wider point of view. Let’s consider pedestrian accidents specifically. According to the National Highway Traffic Safety Administration (NHTSA), 5,987 pedestrians were killed in auto collisions in 2016. Numbers from the Utah Department of Public Safety reveal that a total of 1,006 pedestrians in the state were struck by motor vehicles in 2016. Of that total, 898 were seriously injured and 39 were killed. Cars share the road with bicyclists and pedestrians, and must yield the right of way. When drivers are reckless and do not yield the right of way, this can lead to serious accidents. 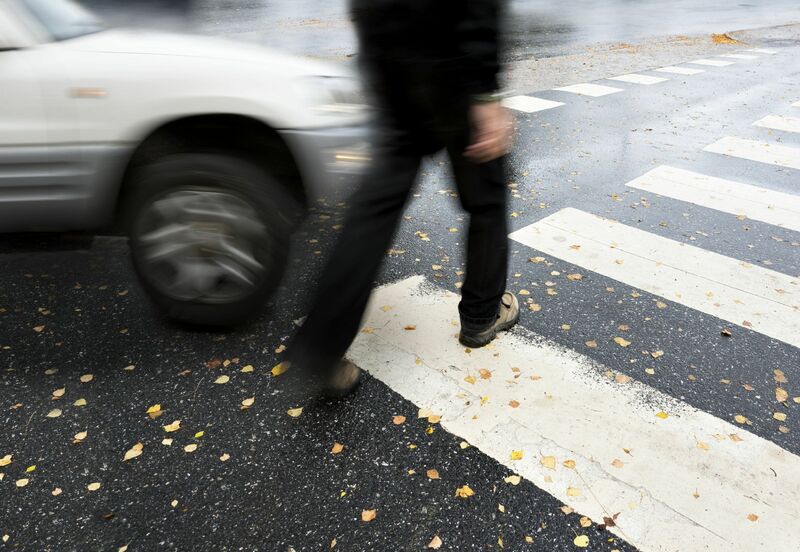 According to findings by the Utah Department of Public Safety, drivers failing to yield the right of way was the cause of 36 percent of pedestrian accidents in which the driver was responsible. Running a red light is obviously a danger to other motorists as well as pedestrians. The risk of a T-bone crash is higher, as well as striking a pedestrian or bicyclist who is simply crossing an intersection lawfully. Driver distraction is becoming a bigger issue this days given how cellphones play a role in our daily lives. Texting while driving, making calls behind the wheel, and even eating while driving can all increase the risks of car accidents as well as striking pedestrians and bicyclists. The Utah Department of Public Safety estimates that driver distractions played a role in 8 percent of pedestrian accidents in which the driver was responsible. Speeding makes accidents more likely since drivers do not give themselves time to slow down or other enough time to react. Just a few miles per hour over the limit can make the difference between a crash and a near miss. The Utah Department of Public Safety estimates that 4 percent of pedestrian accidents in which the driver was responsible were related to speeding. Driving while drunk makes reckless behaviors and decisions more likely. This is why it’s illegal to operate a vehicle while under the influence of alcohol or any kind of controlled substance. People who drink and drive put everyone’s lives at risk. Pedestrians and bicyclists should also be sober while getting around as intoxication can result in dangerous situations of various kinds. If there isn’t enough light on a road, a driver may not be able to see you. Even with headlights on, driving at night is dangerous. According to the Utah Department of Public Safety, bad lighting on a road contributed to 6 percent of pedestrian accidents. Sometimes crosswalk and intersection accidents are not the fault of drivers or pedestrians but the traffic signals and signs. When signals malfunction or traffic signs are not where they should be, local municipalities and road authorities should be help accountable for having such a dangerous situation. For more information about your legal rights and options after an auto accident, be sure to contact an experienced injury accident lawyer. Our lawyers are here to help you. You can also reach our law firm by phone at (801) 375-9801.